Classic overreaction, or justified outrage? There are few things more frustrating for a motorcyclist than being put in unnecessary danger by a careless driver. A wise biker once told me to pretend everyone around me is drunk and blind while I’m on two wheels, and it’s advice I follow every time I ride. Otherwise, you might end up in an unfortunate encounter like the irate star of this viral video. Filmed from the biker's helmet cam in what appears to be South Windsor, Connecticut, the video shows him arguing with the driver of a Honda Civic following a tight merge that got a little too close for his comfort, then getting his revenge by flagging down a cop to pull the driver over. The title of the video is "Woman cuts [off] biker. Regrets it instantly." But before you decide where the blame really falls, watch the clip in full. The biker starts out in the left lane of a two-lane road, traveling at normal surface street speeds. The right lane gradually ends, and the Civic pulls up alongside the motorcycle in an attempt to squeeze by and pass him. This is probably a familiar feeling for everyone—but he clearly feels entitled to his spot in traffic, and despite noticing this happening well before the merge point, refuses to slow down. Instead, he rides right up alongside the Civic in order to shout obscenities at the driver, who's clearly confused as to why he's so angry. When he’s done yelling at her and shouting her license number aloud for the camera, he rides ahead until he finds a police officer in a parking lot and tells him that the Civic driver cut him off. The cop then takes off to pull her over as the biker follows close behind. The video ends with both parties at the side of the road, with no details as to what happened next. 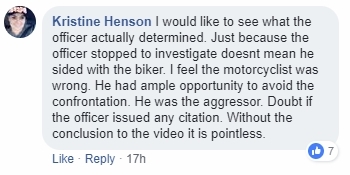 As you can probably imagine, there are some very opinionated comments on this video shared on the Adventure Bike Rider Facebook page. Here are some of the greatest hits. Fellow riders, I know how annoying it is when cars don’t pay attention to you and cut you off, but please, don't handle those situations like this guy did. If this happens, hit the brakes, maybe make a certain angry gesture if it's warranted, and move on. If a dangerous situation presents itself, always take the defensive approach because the stakes are just too high when you’re on a motorcycle. So is this a classic overreaction or justified outrage? Watch and judge for yourself. These out-of-control Canadian madmen didn't even say sorry.